It was an evening in 1811. Twenty-two-year-old Robert Hay was leisurely walking through a London neighborhood. Suddenly he was accosted by a group of shady characters eager to know if he was a seaman. Within hours he found himself aboard a British Naval vessel setting sail for the open sea. In American parlance, Robert Hay had been "Shanghaied" - forced into naval service against his will. In England, the same activity was described as "Impressment." Impressment had been a common method of filling the ranks of the British Navy since the seventeenth century, particularly in times of war. Gangs of British seamen would rove the streets of seaports in search of likely candidates for naval service. Once targeted, these hapless victims were forcibly taken aboard ship and sent to sea. Britain's life or death struggle with Napoleon at the beginning of the 19th century created a desperate need to fill the ranks of its war ships. 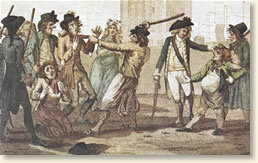 Impressment was revitalized with vigor - a situation that would have direct consequences for the relations between Britain and America. Not surprisingly, this method of recruitment combined with the harsh conditions aboard British naval ships to create a high rate of desertion among its crews. In response, Britain initiated an aggressive campaign of retrieving deserters. This included stopping and searching American merchant ships on the high seas. Many of those targeted as deserters during these raids claimed American citizenship - a claim that was ignored by the British. Tensions between the two countries escalated and contributed to the outbreak of the War of 1812 - America's "Second War of Independence." Britain's impressment campaign would also have direct consequences for Robert Hays as he innocently strolled the streets of London. "Take my advice, my lad, (he said)...and enter the service cheerfully." "I was, when crossing Towerhill, accosted by a person in seamen's dress who tapped me on the shoulder enquiring in a familiar and technical strain' What ship?' I assumed an air of gravity and surprise and told him I presumed he was under some mistake as I was not connected with shipping. The fellow, however, was too well acquainted with his business to be thus easily put off. He gave a whistle and in a moment I was in the hands of six or eight ruffians who I immediately dreaded and soon found to be a press gang. They dragged me hurriedly along through several streets amid bitter execrations bestowed on them, expressions of sympathy directed towards me and landed me in one of their houses of rendezvous. I was immediately carried into the presence of the Lieutenant of the gang, who questioned me as to my profession. . . I made some evasive answers to these interrogations . . . but my hands being examined and found hard with work, and perhaps a little discolored with tar. . . I was remanded for further examination. Some of the gang then offered me spirits and attempted to comfort me. . .he very scoundrel who first laid hold of me put on a sympathizing look and observed what a pity it was to be pressed. . .. Such sympathy from such a source was well calculated to exasperate my feelings, but to think of revenge was folly. . . . In a short time I was reconducted for further examination before the Lieutenant, who told me as I was in his hands and would assuredly be kept I might as well make a frank confession of my circumstances, it would save time and insure me better treatment. . .. I therefore acknowledged that I had been a voyage to the West Indies and had come home Carpenter of a ship. His eye seemed to brighten at this intelligence. 'I am glad of that, my lad,' said he, , we are very much in want of Carpenters. Step along with these men and they will give you a passage on board.' I was then led back the way I came by the fellow who first seized me, put aboard of a pinnace at Tower Wharf and by midday was securely lodged on board the Enterprise. As soon as the boat reached the ship I was sent down into the great cabin, in various parts of which tables were placed covered with green cloth, loaded with papers and surrounded with men well dressed and powdered. Such silence prevailed and such solemn gravity was displayed in every countenance that I was struck with awe and dread. . .. No sooner did I enter the cabin door than every eye was darted on me. . . . I falteringly replied that I could not think of engaging in any service voluntarily when I knew of a better situation elsewhere. He said no more, but making a motion with his hand I was seized by two marines, hurried along towards the main hatchway with these words thundered in my ears, 'A pressed man to go below'. What injustice and mockery thought I . . . but my doom was fixed and I was thrust down among five or six score of miserable beings, who like myself had been kidnapped, and immured in the confined and unwholesome dungeon of a press room." This eyewitness account appears in: Hay, M.D (ed. ), Landsman Hay -The Memories of Robert Hay 1789-1847 (1953), republished in: Charles-Edwards, T. and B. Richardson, They Saw it Happen, An Anthology of Eyewitness's Accounts of Events in British History 1689-1897 (1958). 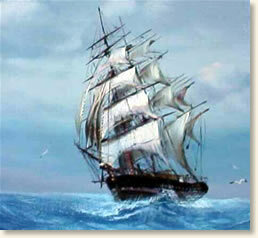 "Shanghaied," 1811, EyeWitness to History, www.eyewitnesstohistory.com (2009). Britain ended its practice of Impressment at the close of the War of 1812. Shanghaing was not outlawed in the United States until 1915.